A major new report published today based on a survey of local residents reveals the public perception of domestic abuse and the urgent need to tackle it. Last year in Sutton, domestic abuse accounted for more than a third of incidents of violence resulting in injury (467 out of 1,242)* and Sutton had the twelfth highest number of reports of domestic violence per 1,000 people out of the 32 London boroughs. 96 per cent said they were familiar with the concept of domestic abuse. Women were more likely to say they were familiar with domestic abuse. 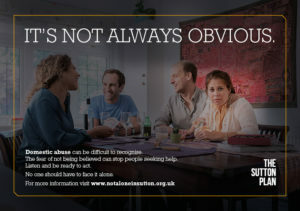 Nearly two thirds said domestic abuse was a problem in Sutton. 55 per cent said they would feel comfortable discussing concerns about domestic abuse with friends, 46 per cent with family, 18 per cent with neighbours. 44 per cent would know where to go if they needed help from domestic abuse services. 37 per cent would know where to go if they were concerned about their own behaviour. Fear of making things worse was the top reason given as a barrier to seeking support, followed by uncertainty of what would happen to children. Many incidents of domestic abuse are not reported to police. The estimated number of victims is thought to be much higher than the number of incidents and crimes recorded. Domestic abuse has been identified as an urgent policy priority of The Sutton Plan, a partnership of 23 local public, private and voluntary organisations. The Domestic Abuse Transformation Programme has been launched in Sutton, with £1.25 million being invested over three years to improve awareness and services relating to domestic abuse, including early intervention and prevention, such as working with schools. The survey’s findings are now being used alongside the findings of an independent review of local services to improve the services Sutton provides and the support offered to address issues of domestic abuse over the next two years.